My 9 year old daughter has recently finished making a Mosaic Cupcake which now hangs in the kitchen. It looks so good that I want to share the instructions. So many friends have commented on it and asked her to make them one that Elizabeth could have a little business making mosaics! Cupcakes are so popular that lots of people are looking to make their own cupcake decorations, and this mosaic is a great way to start. Draw your design onto the wooden board. This will be the guide for placing tiles. Break tiles into pieces which will match the design pattern. You will need a variety of shapes, sizes and colors. Pieces should fit neatly together without large spaces between them. Put tiles onto board and when you are satisfied with the placement, glue into place. Mix up grout, according to the directions on the packet and pour grout over the tiles. Push grout into spaces between tiles. You will need to work fast as the grout dries quickly. Wipe away excess grout with a damp cloth. Rinse cloth often and keep wiping until there is no excess grout on tiles. 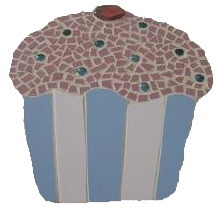 With Elizabeth's mosaic, the board was cut to the shape of a cupcake and the edges sanded. This is not necessary, as you can draw the cupcake and tile the background to keep the shape square. A border of brightly colored tiles can be placed around the edge. Our design template is approximately 30cm x 36cm (12in x 14in).